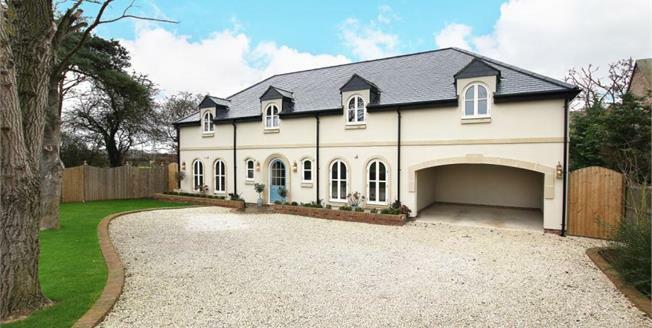 Look at this superbly designed beautiful detached family home done to the highest of standards! Situated in the popular and sought after village of Kirk Smeaton, it is ideally located having fantastic commuting links, being less than a FIVE MINUTE drive away of the A1 motorway. A charming, extremely large four bedroom detached house being full of character and style. Uniquely designed and built in 2017, this stunning property boasts modern yet traditional aspects and promotes a high yet easy living family lifestyle. The set back property is welcomed by a low maintenance but beautifully set out large limestone shaped pebbled driveway and well maintained lawn area which really compliments the pretty building. The driveway and integral car port provides off street and secure parking for a number of vehicles. Entering into the home is an impressive entrance area with an open staircase rising up to the first floor. The majority of the ground floor possesses an open plan feature, with the kitchen, dining area and lounge all being open but still having an incredibly cosy atmosphere. Starting at the kitchen, which has a lovely traditional feel, it benefits from a number of upgraded features and an island with a breakfast bar, from here patio doors lead out to the rear garden. Next to the kitchen sits a dining area which is perfect for entertaining and also has a view out into the admirable garden. The dual aspect lounge hosts a stunning log burning stove and again, has patio doors leading out to the rear garden. Also to the ground floor is a snug area which lies to the front of the property and would suit a variety of uses which may include play room, study or an additional sitting room. Conveniently there is also a w/c and a utility room. The whole of the ground floor aids Italian porcelain floor tiling with under floor heating! To the first floor, the master bedroom includes a large en suite with bath AND walk in shower and a big walk-in wardrobe. The second bedroom benefits from fitted wardrobes and another en suite shower room, and bedrooms three and four are both spacious double rooms. Centrally in the bathroom is an amazing 'open' shower which is a great feature point. Also to the first floor is an incredibly convenient walk-in storage cupboard complete with shelving. To the rear is a carefully thought out garden with a shaped patio area overlooking the large lawned area. There are also many storage areas outside including a room where the boiler is housed. The small village of Kirk Smeaton benefits from a post office/store, public house, St. Peters Church and Kirk Smeaton primary school. The A1 is reached in less than 5 minutes and provides easy reach to M62, M18 and M1 meaning commuting links are fantastic! Doncaster train station has a main line rail link with London Kings Cross which takes from 105 minutes.